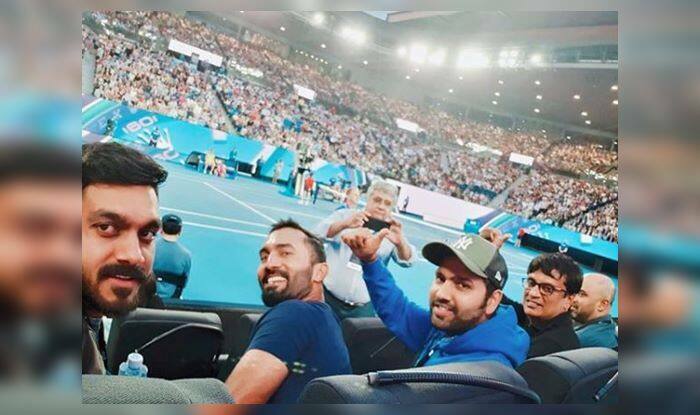 The Indian cricket team has reached Melbourne and the cricketers were spotted catching up with some tennis action at the Australian Open. Rohit Sharma, Dinesh Karthik, and Vijay Shankar were present at Melbourne Park. The Indian cricket team has reached Melbourne and the cricketers were spotted catching up with some tennis action at the Australian Open. Rohit Sharma, Dinesh Karthik, and Vijay Shankar were present at Melbourne Park. The team has reached traveled from Adelaide to Melbourne after the Indian win last night and it seems the cricketers are making the most of the time in-between matches Down Under. Rohit Sharma slammed his 22nd ODI hundred at Sydney in a losing cause, whereas Karthik’s 14-ball 25 unbeaten helped India win at Adelaide and level the series. Rohit Sharma took to Instagram to his fans a glimpse of it. It was Karthik’s 57-run-stand with Dhoni that helped India get over the line in a 299 chase with four balls to spare. Earlier, it was India captain Virat Kohli who set it up with a brilliant 104 off 112 balls. It was his 39th ODI ton. Meanwhile, it was the day to forget for Indians at the Melbourne Park as their challenge at the men’s doubles event of the Australian Open came crashing down in a single day with three pairs featuring Indians suffered first-round defeats, here Wednesday. The 15th seeded Indian team of Rohan Bopanna and Divij Sharan, who began their partnership with a bang in Pune, lost 1-6 6-4 5-7 to the unseeded Spanish pair of Pablo Carreno Busta and Guillermo Garcia-Lopez. It is a second straight first-round defeat for the new Indian team on the tour after their triumph at the Tata Open Maharashtra. Last week, they had lost the round of 16 at the Sydney International. Competing in his 24th Australian Open, veteran Leander Paes and his partner Miguel Angel Reyes-Varela saved a few match points but eventually fell 5-7 6-7(4) to American-Kiwi combo of Austin Krajicek and Artem Sitak.